If you like things spicy, you will absolutely love our Spicy Cilantro Dressing! You can either kick up the heat or dial it back depending on your taste buds, but this sauce will make a great topping or dipping condiment for any food. It's really quick and easy to put together and it will last in the fridge for weeks. We have a thing for making desserts and foods that we love and miss the most. However, we've now moved to a certain point where we can create a delicious meal and still want more. We need a sauce to bring on extra spice and flavor! 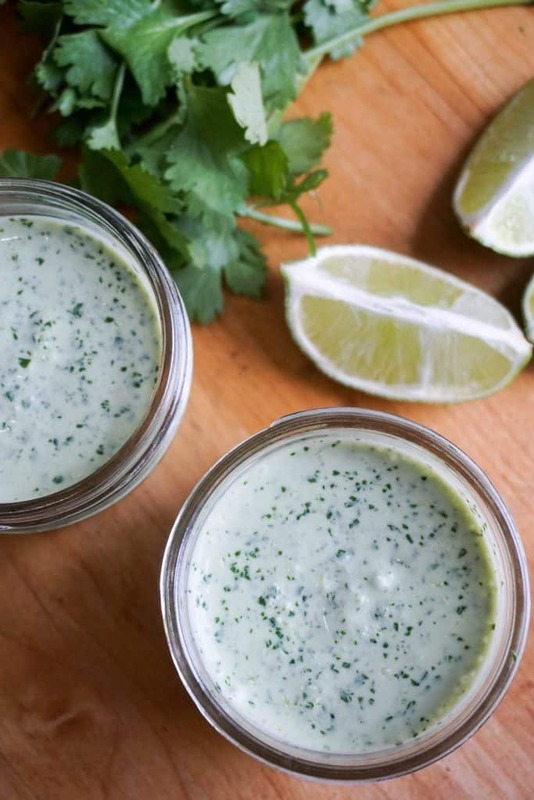 We could have gone the easy route with a ranch or blue cheese dressing, but we wanted something more refreshing so as our first dressing recipe we created a jalapeno cilantro sauce. How great does that sound?! How To Make Cilantro And Jalapeno Sauce! Making it is the easy part. It's deciding what to use it for which is the hard part. All you need to do is add the ingredients to a processor and pulse until you get a smooth consistency. So simple, yet so spicy. You can tweak the ingredients in any way you like. More cilantro, less jalapeno or more sour cream for a fresh, creamier texture. Now, deciding how to use it was where I was at odds. We just created shrimp tacos using our low carb tortillas, which sounds like the perfect vessel, but we decided to use it for salmon and it took the fish to whole new level! You can use it as a dipping sauce or salad dressing too. Get a little crazy! If you're into spicy foods we have got some other great recipes for you. We've got a spicy Bacon Jalapeño Popper recipe that is great for entertaining or prepping for the week! We also have one of our most popular recipes, Mexican Shredded Chicken, that gets it's kick from adobo chilis! Let us know what you think of our spicy cilantro dressing and how hot you like it. Recipe can be quickly added to MyFitnessPal - Search "KetoConnect - Cilantro Sauce"
Slice the jalapenos in half lengthwise and remove the seeds (if you like extra spicy you can keep some or all of the seeds) and place in the processor. Add cilantro, lime juice, sour cream, garlic, and salt, and pulse a couple times. Add the olive oil and process until full combined and smooth. Taste test and add more of any ingredient until processed to your liking! Serve as a dipping sauce or dressing. TIP: The recipe will make between 1 -1.5 cups depending on how you tweak the recipe. We love to eat it over shrimp tacos or salmon!